— It may not feel like it out there, but winter is here! And while we’re enjoying some hot chocolate by the fireplace, we’re offering up our list of the events you won’t want to miss this winter. Whether you’re planning a winter getaway or just looking for something to do close-by, Middleburg has plenty to offer. So, share your memories with us using #Middleburgmoment and be sure to mark your calendars! The Middleburg Arts Council is sponsoring “The Country Way” at The Byrne Gallery, featuring artwork inspired by the country way of life. An opening reception for the juried art show will be held Feb. 4 from 2-5 p.m., with a talk by juror Robin Hill at 3 p.m. Featured artists include Debbie Cadenas, Maribe Chandler-Gardiner, Teresa Duke, Gail Guirreri-Maslyk, Cody Leeser, Tom Neel, Alice Porter and Katherine Riedel. If you want to wow your Valentine this winter, treat your sweetheart to an elegant dinner at one of Middleburg’s fine restaurants. Harrimans Virginia Piedmont Grill is offering an an enchanting five-course dinner created by Executive Chef Ryan Aresndorf, followed by a sweet finish crafted by Executive Pastry Chef Jason Reeves. The cost is $300 per couple, with an additional $60 for a wine pairing. This special menu will be served Feb. 11-14. For reservations, please call 540-326-4070. You can also celebrate Valentine’s Day with your special someone at Goodstone Inn & Restaurant, winner of a 2016 OpenTable Award for the Most Romantic Restaurants in America. This four-course menu will be offered Feb. 11-14 and includes items such as local oysters, seared pheasant and raspberry mousse. The cost is $120 per person, exclusive of wine, alcohol, tax and gratuity. Call 540-687-3333 to make your reservations or book online today! Another option for Valentine’s Day is the Red Fox Inn, which is featuring a five-course game and seafood dinner on Feb. 14. The menu includes items like bacon and cornbread stuffed quail, lobster bisque, grilled venison and bananas foster crème brûlée. The cost is $165 per person, not including taxes, gratuity and beverages. You can reserve your table online or by calling their front desk at 540-687-6301 between 10 a.m.–4 p.m., Monday–Friday. If you want to make it a romantic evening or weekend trip, you can also book a room at Salamander Resort & Spa, Goodstone Inn, Red Fox Inn or Briar Patch Bed & Breakfast Inn or book a guest house or hunt box through Hunt Country Accommodations. Salamander’s Season of Romance getaway includes a $100 resort credit to use towards a romantic dinner in Harrimans, a relaxing treatment in our award-winning spa or a charming trail ride through the country side. And, you can cap your night off with a complimentary bottle of sparkling wine and chocolate-covered strawberries. You can make your reservations online or by calling 844-303-2723. Red Fox Inn is offering a special for Valentine’s Day that includes sparkling wine and chocolates in your room upon arrival, preferred tavern seating for the Valentine’s dinner and a hunt country breakfast in the morning. You can make a reservation online or by calling their front desk at 540-687-6301 between 10 a.m.–4 p.m., Monday–Friday. While you’re in town, be sure to drop by our local vineyards as well. Greenhill Winery & Vineyards is offering a special Wine & Truffle Pairing Feb. 11-14 from noon until sunset. 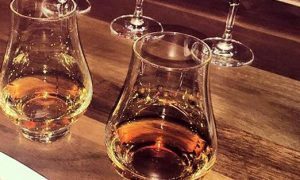 For $26 per person, you can enjoy four exotic flavored hand-made truffles from Zoe’s Chocolate Co., each carefully paired with four of Greenhill’s award-winning wines while a wine educator guides you through them in a seated tasting. Boxwood Estate Winery is offering a special Wine, Cheese and Chocolate Tasting Feb. 11-12, with seating in “Cupid’s Cave” (the barrel room). The cost is $55 per couple and reservations can be made at michele@boxwoodwinery.com or 540-687-8778. Or, treat someone special to a fun and romantic Valentine’s weekend at Three Fox Vineyards. 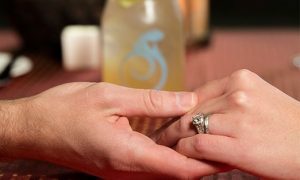 You can share a bottle of wine with the one you love in their cozy tasting room and let the romance of Three Fox warm your heart and soul Feb. 11-12. They will have a very special hot chocolate made with Three Fox Cabernet Franc and their Thibaut-Janisson Sparkling Chardonnay will be 10% off all weekend. 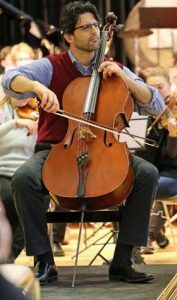 This fundraiser for the Community Music School of the Piedmont will feature internationally-renowned Israeli-American cellist Amit Peled, voted one of the most influential music professionals of 2015 by Musical America. The New York Times describes his playing as possessing “glowing tone, a seductive timbre, and an emotionally pointed approach to phrasing that made you want to hear him again.” In addition to solo recitals and orchestral guest appearances, Peled is a founding member of the famed Tempest Trio and a faculty member at Peabody Conservatory. Doors will open at 5 p.m. A reception and silent auction will follow the concert. Tickets are $125 each and can be purchased online. Join the town of Middleburg Feb. 17-20 for the 6th annual Winter Weekend Sale. During the Winter Weekend Sale, visitors will be able to hunt for some wonderful gifts for themselves and others while experiencing the small town charm of Middleburg. The sale, sponsored by the Town of Middleburg and the Middleburg Business & Professional Association, will be held Friday and Saturday from 10 a.m.–5 p.m. and Sunday and Monday as posted by shops. Many of the unique shops in the village will have discounts on everything from shoes to children’s clothes to fall and winter fashions, as well as specials in some of the local restaurants. Just look for the blue and white balloons outside participating stores. Arrive early to get the best bargains—or better yet, stay over at one of the inns in town (Red Fox Inn, Goodstone Inn, and Salamander Resort & Spa) and make a weekend of it! When you need a little respite from all of the bargain hunting, visit the National Sporting Library & Museum on The Plains Road or stop in one of Middleburg’s fine restaurants scattered along Washington Street, Federal Street and Pendleton Street. You can pick from the likes of the Red Fox Inn (contemporary American food), Middleburg Common Grounds (coffee, tea and sandwiches), Market Salamander (gourmet market and café), Popcorn Monkey (20 flavors of popcorn), Upper Crust Bakery (baked goods and sandwiches), Gold Cup Wine Bar, the restaurant at Goodstone Inn and Harrimans Virginia Piedmont Grill. Enjoy an exclusive four-course dinner paired perfectly with selections from local vineyards in Harrimans’ intimate, private dining room. Maximum 24 people. $150 per person. For reservations, please call 540-326-4070. This symposium is being held at The Hill School in Middleburg on Saturday, Feb. 25. 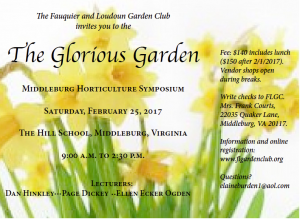 “The Glorious” Garden is sponsored by the Fauquier and Loudoun Garden Club and will feature Page Dickey on “Some Favorite Gardens and Why” and more. Vendors selling plants, accessories and books will be available throughout the day. Registration is $150 and can be done online. Join Salamander Resort & Spa‘s new executive chef for a “Meat” & Greet as he shows guests how to break down venison, duck and wild boar shoulder to make homemade wild game sausage. In addition to using a meat grinder, learning how to season properly and filling sausage links, guests will be able to get to know Chef Ryan Arensdorf, discuss his passions and find out what he has planned for the culinary offerings at the resort before enjoying suckling pig with brussel sprouts and venison game sausage with charred peppers and rustic vegetables at the conclusion of the class. $79 per person. Maximum of 12 people. For reservations, please call 540-326-4070. This annual event at the Middleburg Community Center raises funds for wildlife and habitat enhancement projects. The event features dinner by Tutti Perricone of Backstreet Catering, as well as live and silent auctions and numerous raffles. This event will sell out again, so get your tickets early! Call Rich Vigue at 703-217-4988 or Danny Smedley at 540-222-4994 for more information. Experience an exciting St. Patricks weekend at Gold Cup, with classic Irish fare paired with the best Irish whiskey and traditional sounds of live Celtic entertainment. This will truly be a weekend to remember! Salamander Resort & Spa is making room for new wines in 2017 and they need your help. Harrimans’ cooking studio becomes a retail wine shop for one day only, where you can shop for bargains to stock up your wine rack. Shakespeare in the ‘Burg is celebrating its fourth year in Middleburg! The festival brings the plays of William Shakespeare alive in the bucolic countryside of Virginia. In addition, the festival hosts workshops in stagecraft and acting, and a One Act Playwriting Competition, with public readings or performances of the winners! 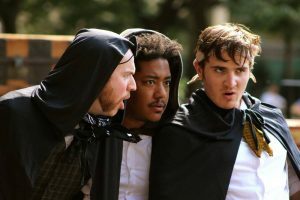 This year, Shakespeare in the ‘Burg is pleased to present our new theater company, Shakespeare in the Square, coming to us from New York City. They will also have a special performance by Nicolo Whimsey for our younger fans.